Ensemble came packaged as a deluxe 16pp hardback full color book with a 140 gm LP mastered by Jeff Lipton and Maria Rice at Peerless Mastering. The audio download that came with the Ensemble book/LP also included two exclusive tracks not available on the standard digital version. Essays by Stacy Blint, Faith Coloccia, Brent Gohde, Sally Haldorson, Chris Koelle, Tom Lecky, and David Ravel. Over the course of various releases, the self-titled debut Death Blues (Hometapes/Taiga), Here (Rhythmplex), Non-fiction (SIGE), as well as the text only Death Blues manifesto, drummer and percussionist Jon Mueller’s Death Blues project has used sound, performance, and concept to explore ideas around presence and experience. This work culminates in the release of Ensemble, an elaborate book/LP/digital release that features seven essays about our vulnerability, the rawness of our inner lives, and how we move forward in the face of it all. The audio is an expansive orchestral soundtrack crafted by Mueller and composer/multi-instrumentalist William Ryan Fritch over the course of two years. Like the essays, the music exemplifies complex emotional and textural layers via strings, woodwinds, percussion, and wordless vocals, ranging from cinematic and dreamful to thundering and powerful over the course of its nine tracks. 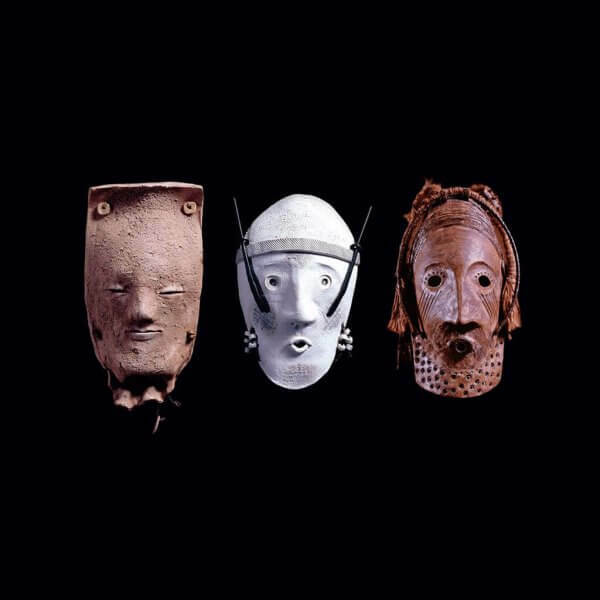 Late artist Lillian Rammel’s hand-made masks from the 1970s are featured throughout the package, symbolizing inward and outward perceptions. The combination of audio, text, and visual create an immersive and broad experience. This is work about people, for people. Music composed, arranged, and performed by William Ryan Fritch and Jon Mueller. William Ryan Fritch: vocals, keys, bowed and plucked strings, horns, woodwinds, mallets, and additional percussion. Jon Mueller: hammered acoustic guitar, drums, and percussion. Recorded February 6, of 2012 through October 22nd of 2013 in Petaluma, CA, Houston, TX, and Milwaukee, WI by William Ryan Fritch, James Thompson, and Shane Hochstetler. Mixed by William Ryan Fritch. Mastered by Jeff Lipton at Peerless Mastering, Boston, MA. Assistant Mastering Engineer: Maria Rice. Writing by Stacy Blint, Faith Coloccia, Brent Gohde, Sally Haldorson, Chris Koelle, Tom Lecky, Jon Mueller, and David Ravel. Mask sculptures by Lillian Rammel, ca. 1970s. Thanks to Hal Rammel for offering and arranging use of these images. Package, book, and LP designed by Jon Minor. Thanks to everyone that participated in this project, to Teresa Mueller for her continuous support, and to all who are willing to consider this project and its aim.